2018 CLCA Design/Build Award - The winning design/build project was a half-acre residence in west Sonoma County, featuring a fountain, edible and native plants and a Tuscan-inspired design. 2018 CLCA Sustainable Install Award - The sustainable installation was in Petaluma and included rain gardens and predominantly native vegetation over a half-acre section of the property. 2017 John M. McPhail, Jr. Green Business Award - This award is given each year to a business in Marin which exemplifies environmental sensitivity in business, and which has supported and improved communication between the business and environmental communities. Houzz is the leading online platform for home remodeling and design. Houzz connects millions of homeowners, home design enthusiasts and home improvement professionals across the country and around the world. This award is based on ratings at the highest level for client satisfaction by the Houzz community. 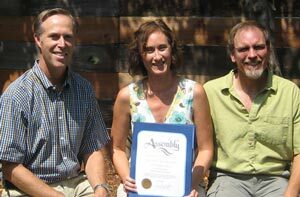 Jared Huffman, State Assemblyman for Marin and Sonoma Counties, presented his Sustainable North Bay Award to Equinox Landscape Construction for their innovative and environmentally responsible business practices. Receiving the award are Heather and Patrick Picard, co-owners of Equinox Landscape Construction.